In June of 1889, Andrew Carnegie published his essay “Wealth” in the North American Review: a famous document, as remarkable for the author’s delusional self-regard as it is for the case he makes for private philanthropy. The steel baron launched his argument with the dumbfounding claim that until “the past few hundred years [of human history] there was little difference between the dwelling, dress, food, environment of the chief and those of his retainers.” He then sails blithely along to insist that we should all welcome the changes in society that make violent wealth inequality inevitable, because the benefits of wealth must inevitably trickle down to the least fortunate, etc., an assertion that many of later generations have come to view with a certain skepticism. Despite the self-congratulatory hallucinations, “Wealth” contains a genuinely noble philanthropic message. The rich man has a duty to live unostentatiously, Carnegie argues — to provide modestly for his own dependents, and “to consider [the balance of his wealth] simply as trust funds, which he is called upon to administer […] to produce the most beneficial results for the community.” He goes on to say, unblushingly, that the man of wealth is the ablest, best kind of man, who should therefore become “agent and trustee for his poorer brethren, bringing to their service his superior wisdom, experience, and ability to administer, doing for them better than they would or could do for themselves.” One may wonder how these last remarks would have been received by the jailed and brutalized strikers of Carnegie’s Homestead Mill. If Carnegie’s gospel of wealth recalls to you the rhetoric and the general mindset of modern philanthropists such as Bill Gates, Pierre Omidyar, Michael Bloomberg, Sergey Brin and Larry Page, I can’t say I blame you. His Gilded Age vision of the industrialist’s lordly prerogative has survived mostly intact. This is all the more striking for the vast changes wrought in the American social contract since Carnegie’s time. “There was no social welfare state in the 19th century,” Robin Rogers told me recently; she’s a sociologist at Queens College working on a book about how billionaire philanthropy is shaping public policy. When “Wealth” was published, America had yet to develop a concept of the absolute equality of its citizens, let alone any fixed mechanisms that might ensure their fair treatment in the Darwinian tumult of the industrial age. “The accountability that we expect today was simply not a part of what people thought,” Rogers says; there were no child labor laws, no universal suffrage, and virtually no federal or state programs for social welfare of any kind. Today’s billionaire philanthropist no longer operates in such a vacuum. The great successes of late 19th and early 20th century philanthropy, such as the transformation of medical education that began with the Flexner Report in 1906, served to pave the way for later, and far larger, government initiatives. But since the 1970s or so, philanthropists have grown less inclined to see their organizations as laboratories for the advancement of the American welfare state; instead, they have increasingly sought to develop projects that compete with, or supplant, the efforts of government. In fact, right-wing funding organizations such as the Koch and Scaife foundations routinely position themselves as the explicit adversaries of government. So we may now legitimately question whether the “ablest” individuals, according to Carnegie’s formulation, really can serve the needs of the disadvantaged better than the government — which is to say, ourselves, in the form of our elected representatives — can do. Despite First Amendment protections and the availability of Internet anonymity, feelings of institutional allegiance and desires to avoid conflict, especially with colleagues that we respect and work with every day, cause many of us not to speak up on controversial topics. And because of the unique structure of our sector, where foundations enjoy the power of the purse, criticism of our sector is even harder to come by. Afterward we drove to Chelsea. It was a vile night, bleak and bitter. On alighting, a man came up to me. He wore a short jacket which he opened. From neck to waist he was bare. I gave him a shilling. Then came the rebuke. With entire simplicity Wilde took off his overcoat and put it about the man. Private foundations pay almost no taxes. In exchange for their expansive tax breaks, they are required to distribute 5 percent of their assets every year. And with wealth consolidating ever upward in America, private foundations are growing like topsy. More than 120,000 such groups controlled around $583 billion in 2010. Foundations provide about 13 percent of the money given to charity in the United States, a proportion that currently works out to around $41 billion annually. The rest comes from bequests and individual philanthropists — ordinary people who write checks to Doctors Without Borders at the end of each year, or to the Red Cross when there is a disaster. The total given to charity in the U.S. amounts to about 1.7 percent of GDP, a far higher proportion than in other developed nations. In the UK the figure is about 0.7 percent, in Germany 0.22 percent, and in France 0.14 percent. With wealth consolidating ever upward in America, private foundations are growing like topsy. More than 120,000 such groups controlled around $583 billion in 2010. This apparent discrepancy is widely mischaracterized. Howard Davies, former director of the London School of Economics, noted dryly in theGuardian that “with the French it is clear that richesse n’oblige pas du tout.” Mais bien sûr, it should also be noted that the top tax rate in France is 50 percent, not counting an extra moneybags-surtax for high-net-worth individuals, the impôt de solidarité sur la fortune, plus a Value Added Tax of more than 19 percent. These revenues are used to fund, among other things, a first-rate single-payer health system for every French citizen. The French trust in their government, rather than their billionaires, to look after disadvantaged people, and they accept high tax rates as a fair price for those services. In the United States, this logic has been trending the opposite way for decades. In his 2000 book, The Paradox of American Democracy, John B. Judis makes the case that the American elites who run our large institutions have failed to protect their disadvantaged fellow citizens. Judis blames this failure on “a disturbing decline in the quality of the American leadership class” — a trend that he sees accelerating in the late 1970s and early 80s, when powerful former government officials such as Henry Kissinger and Alexander Haig founded lucrative lobbying organizations, and bankers, lawyers and business leaders began to confine their public activities to lobbying on behalf of their own industries. The noblesse oblige of American elites from FDR through the Eisenhower years has given way to the claims of a class of policy hands for hire, with the greatest intellectual payoff going, essentially, to the highest bidder. Rich philanthropists are almost invariably described in the press as generous, visionary benefactors; it seems indecorous to complain about a rich man who is apparently trying to give his money away to help people. But the new model of foundation giving comes with a host of hidden costs that bear closer scrutiny. “What are you talking about?” asked Soros. Meanwhile, without any significant public claims on foundation largess, the general run of charitable spending in the United States has taken on the protective coloration of American business culture. At every level, charitable grants have come more and more to resemble investment projects, with a specific, measurable return on equity in mind. Among the dozens of sources I’ve interviewed on the state of the foundation world, every one has singled out this trend as a major shift. The new focus on metrics has brought with it a new breed of nonprofit and for-profit partnerships. Foundations such as the Omidyar Network, established in 2004 by eBay’s founder, Pierre Omidyar, provide both investments in for-profit companies and charitable grants. This approach is called by various names such as “social entrepreneurship,” “venture philanthropy,” and “philanthrocapitalism,” but it all amounts to rather the same thing: controlling charitable giving in order to produce measurable, “sustaining” and/or profitable results. “Philanthrocapitalism” is an especially curious coinage, giving rise to a hitherto unarticulated contrast — namely, with the kind of capitalism that is not-philanthro-. Not devoted to loving our fellow-man. And yet most of us grew up hearing that capitalism (the ordinary kind) was supposed to improve our lives. What gives? I asked Robin Rogers. “The hope is that philanthrocapitalism and capitalism are mutually transforming,” she said. Today’s right wing continues to push these familiar, if questionable, ideas: that business is good at measuring and achieving set results and goals, while government mysteriously lacks such abilities; that business is pragmatic, efficient and uninterested in ideological point-scoring; that every institution would benefit from being “run like a business,” as George W. Bush, a notoriously failed businessman (and president) described how he intended to govern the nation. At this moment of crisis, Brinker was left flailing around and citing “metrics” (a repeated mantra in her public statements) as a key reason for the funding cuts, without ever mentioning exactly what it was that needed measuring. The deficiencies of this reasoning came abruptly to light in the recent contretemps at the Susan G. Komen Foundation, after the famous breast cancer charity announced a plan to withdraw cancer-screening funding from Planned Parenthood. The cuts appeared to be a matter of plain politics, a function of Komen’s opposition to Planned Parenthood’s advocacy for reproductive choice. NBC reporter (and breast cancer survivor) Andrea Mitchell promptly called out the policy shift in an interview with Komen founder Nancy Brinker, who was caught completely flat-footed. At this moment of crisis, Brinker was left flailing around and citing “metrics” (a repeated mantra in her public statements) as a key reason for the funding cuts, without ever mentioning exactly what it was that needed measuring. Public pressure eventually forced the Komen Foundation to reverse course — and to accept the resignation of the conservative Komen Vice President Karen Handel, who had instituted the suspension of Planned Parenthood’s funding in the first place. Even so, the Komen overreach was revealing. It doesn’t take much imagination to see that this new blurring of the lines between nonprofit and for-profit activities is bound to create a blurring, also, of the traditional aims of philanthropy — namely, to provide help to the disadvantaged disinterestedly, as opposed to furthering the donor’s business or political goals. In the 1940s, The Rockefeller Foundation launched a drive to develop new high-yield crops in order to improve Mexican agricultural productivity. The subsequent explosion of food production in the developing world in the 1950s and afterward, known as the Green Revolution, is now a textbook illustration of the world-changing breakthroughs that philanthropy can achieve — and of the dangers it courts. The Rockefeller Foundation’s original motives were not purely altruistic; there were strong geopolitical reasons for fomenting the Green Revolution. The leftist government of Mexico had nationalized Standard Oil’s assets at enormous cost to the firm in the late 1930s; when a far more business-friendly administration came into power in 1941, Rockefeller trustees and the American government were keen to prop it up by preventing increased hunger and unrest: Bread, at least, if not circuses. Rockefeller Foundation researcher Norman Borlaug won a Nobel Peace Prize for his role in this effort; he developed a high-yield dwarf variety of wheat that boosted production so much and so quickly that by 1956, Mexico had become self-sustaining in wheat. The immense social and environmental costs of the Mexican agricultural reforms went unmeasured. Western aid authorities exported the Green Revolution to India, with the same detrimental results: a permanent disruption or destruction of local villages and local agricultural practices; a dangerous loss of biodiversity; huge increases in pollution, particularly in tainted water [PPT]. Again, Green Revolution agricultural practices favored larger farmers, with the result that hundreds of thousands of small farmers were driven from the land, in India as in Mexico. The mass suicides among small farmers in the Punjab are widely thought to be directly attributable to these sweeping agricultural reforms. Measurable results, all right — only they measured “output,” not the number of displaced small farmers or fishing ruined by toxic runoff. Despite all these metrics, which researchers have collected for more than sixty years, the Gates Foundation has joined forces with Monsanto to bring Green Revolution agricultural practices to Africa. And note well that just having enough food doesn’t ensure that the world will be fed. As of 2011, 925 million people were still hungry, according to the World Hunger Organization. Thousands of children in poverty die of hunger in India every day. There is food enough in India to feed their whole population, but not the means of paying for it; the supply side of the equation has been solved, but the demand side has not. Or rather, it has been solved, but in an unintended fashion: Reuters reported last December that India had “sealed deals to export one million tonnes of corn to southeast Asia in the first two months of the season.” Put another way: Export markets may come to trump domestic need. There is also increasing evidence that sustainable farming practices that do not rely on patented Monsanto products can boost farming output without polluting the environment and without the social disruptions that have unsettled poor communities in India and Mexico. But Monsanto will presumably resist attempts to amend Green Revolution practices in favor of its own profit motive. The metrics that guide great foundation crusades are very effective when it comes to persuading us that business, and business-trained philanthropists, can do better — but it appears that metrics don’t matter when they conflict with ideology. I asked Kavita N. Ramdas, a scholar at Stanford, to explain to me why, in light of what we already know about the effects of these reforms in India and elsewhere, the Gates Foundation is still pursuing a new, Monsanto-driven Green Revolution in Africa. Another trend in philanthropic giving is, on the other hand, alarmingly measurable: The blatant purchase of a new Mandarin class of intellectuals to do the ideological bidding of their funders. The Koch brothers fund projects at many other universities large and small, including Clemson University, Brown University, Troy University and Utah State. The Koch brothers fund projects at many other universities large and small, including Clemson University, Brown University, Troy University and Utah State. And when it comes to the ideological vanity of mogul donors, the personal is most definitely political: ThinkProgress reports that some students in Koch-funded programs are required to read Charles Koch’s book, The Science of Success. The Kochs are also key sponsors of the Mercatus Center at George Mason University, whence came the environmental deregulation policies of the Bush years. These activities are not recognizable as philanthropy; they merely lend a benevolent gloss to ideological advocacy. The same methods are employed, with much the same results, by right-wing ideologues such as Richard Mellon Scaife and Richard Viguerie — the so-called “funding fathers” of the modern conservative movement. Here is the ultimate result of Irving Kristol’s exhortations against “disinterested” giving: Without any functional oversight — and indeed with the open collaboration of our academic institutions — foundation spending is seeking to delimit the parameters of American public discourse. This kind of “philanthropy” works toward its own vision of a social order — often, a social order in which the philanthropists stand to benefit materially themselves. And nary a bowl of soup or an overcoat in sight. The foundations-idea complex has also set its sights on remaking another of the key institutions of our democracy — the public school — in its own managerial image. There’s no other way to account for the distorted, counter-empirical shape of the American debate over education. In stark contrast to the parents of America’s public schoolchildren, the Broad and Gates brass won’t be at risk for the failures of their efforts, since they will continue to send their own kids to expensive prep schools. The overarching trends are plain enough: As wealth inequality swells, so do the coffers of private foundations, even as the recession has caused government budgets to shrink. As long as the motives of government and foundations are aligned, that’s not necessarily a problem. But the funders of education reform seek nothing less than the wholesale retooling of public schools, at a time when the nation’s school budgets are stretched to the breaking point. And the writing on the chalkboard grows clearer by the minute: Their market-based educational reforms don’t work. Arne Duncan, our current Secretary of Education, is a former board member of the Broad Foundation. This aggressive organization’s mission statement is “to dramatically transform urban K-12 public education through better governance, management, labor relations and competition.” Does anybody remember asking some rich guy to do all that? Stanford University’s 2009 study of charter schools — the most comprehensive ever done — concluded that 83 percent of them perform either worse or no better than traditional public schools […] Gates and Broad helped to shape and fund two of the nation’s most extensive and aggressive school reform programs — in Chicago and New York City — but neither has produced credible improvement in student performance after years of experimentation. Meanwhile, the school reform movement’s insistence on “merit pay” and “performance-based compensation” consign the nation’s already underpaid teachers to permanent job insecurity. And that, in turn, helps prompt the talented young people whom we could be paying to fix this mess to stay away from teaching in droves. The real miracle is that we have so many great teachers left, who stay in their punishing, frustrating jobs out of a spirit of actual, not pretend, philanthropy. And all the while, there is a clear explanation for why American schoolchildren aren’t doing as well as they might. Consider the experience of the nation’s largest state economy. California’s 1978 passage of Prop 13 gutted funding for state schools. At that time, California schools were among the nation’s best. By 2011, the National Assessment of Educational Progress ranked California’s fourth- and eighth-graders 46th in math and reading. Those years saw most programs in the arts, music and drama cut away, class sizes skyrocket, and teacher salaries and benefits sliced to the bone. Somehow, these metrics seem never to have crossed the transom at the Gates Foundation, or troubled the California-based policy sachems at the Broad shop. Yet the de facto privatization of public school policy is only growing more firmly entrenched. The Broad Foundation continues to sponsor training and job placement for dozens of school superintendents across the country — and continues to pay them a Broad stipend even after they’ve found jobs and are on the public payroll. There’s no oversight in the spending of foundation money. The communities and individuals affected by foundation spending typically have no influence on it at all. This isn’t especially surprising, when you consider that the modern entrepreneurs who establish foundations have typically acquired an allergy to transparency; the best known philanthropists in our age, after all, are Bill Gates, a ruthless monopolist, and George Soros, a hedge fund manager. According to the cult of the alpha executive, the effective business leader makes decisions unilaterally and brooks no opposition. This model of decision-making may pose few real threats when it comes to peddling a terrible Web browser, or inflicting Mr. Paperclip Man on the hapless user of Word. But the public should take note when a billionaire philanthropist‘s tough-guy decision-making effectively sets social policy in ways that can alter the life chances of millions of other people. The trouble with malaria is that it fluctuates naturally from year to year and is caused by a multiplicity of factors (climate, geography, housing, people’s immune status, population movements, etc. etc.) that also fluctuate year to year. So to really determine that a decline or resurgence has occurred, you have to measure in decades, not years. Just a few months ago, for instance, the headlines were all about a 40 percent drop in global malaria mortality; today the headlines are all about a huge increase! There’s a lot of hype about malaria, mostly because of the quest for funding, which is a mess right now. I and others had warned that if the massive scale-up that Gates and Roll Back Malaria were so proud of wasn’t maintained that lives would be lost due to resurgence. Malaria is like a coiled spring; you can depress it by sitting down on it, but as soon as you get up, it jumps back up. Returns are also diminishing on that much-ballyhooed innovation in foundation-backed international aid, the “microloan” organization. These groups finance fledgling entrepreneurs in the developing world, and it now seems as though they have mimicked the practices of Western financiers all too closely: Reports indicate that many have been hamstrung by corruption, political infighting, and an international investor class that doesn’t care where its next fast buck comes from. Nobel Peace Prize winner Muhammed Yunus, the Bangladeshi microlending pioneer behind the Grameen Bank wrote a scorching op-ed piece in the New York Times last January: “Sacrificing Microcredit for Megaprofits,” his argument neatly summed up in the headline. In Yunus’ account, the downward turning point in microfinance came when the programs attracted large-scale investors pressing to realize rapid returns. Once microfinance IPOs were launched in Mexico and India, Yunus noted, reports began to emerge of poor borrowers being harmed (that is to say shaken down, both literally and figuratively) as philanthropy gave way to the need to show quick profits. “Poverty should be eradicated, not seen as a money-making opportunity,” Yunus observed dryly. Philanthropy, philanthrocapitalism, profiteering, ideology: what does it matter what we call these things, when people’s lives are wrecked as the result? Measured in terms of the scale of potential harm, the ordinary plutocrat’s indulgences — megayachts, chalets in Gstaad, private jets and bunga-bunga parties — appear positively noble by comparison. But there are notable exceptions to these patterns; there are foundations that practice transparency and accountability while pursuing economic justice. Those whose mission statements dictate that they serve a local community, for example, are perhaps more likely to consult with that community. Emmett D. Carson is the head of the Silicon Valley Community Foundation, the 38th-largest foundation in the United States, with assets of more than $2 billion. Carson is a charismatic and optimistic leader, and can cheer up even the most jaundiced student of institutional philanthropy in just a few minutes’ conversation. The calm, orderly, modest offices of SVCF in Mountain View are situated not in a sterile office complex, but in a busy, pleasant street in the middle of town with lots of small businesses — beauty parlors, yoga studios, and a terrific hamburger place called Clarke’s just down the street. The SVCF works on local issues including education, immigration, and economic security issues such as foreclosures and payday loans. Officials with the organization go out into the community, talk to people, investigate directly, and work to implement hands-on remedies. “Cracked a lot of heads first,” I noted. Is philanthrocapitalism also forward motion? I ask. Or an emerging threat to philanthropic work? Sonia Shah likewise contends that the global philanthropy can be improved through innovation. In last November’s Foreign Affairs, she outlined a strategy for developing partnerships between business and global health organizations such as the WHO, by encouraging more natural partnerships between industry and philanthropy. Private sector involvement should be expanded to include those companies whose financial interests directly align with those of global health. In addition to mining companies, the fight against malaria could, for example, include insurance companies and tourism operators who will reap long-term profits from healthier customers and less fearful tourists. Similarly, the battle against [noncommunicable diseases] could enlist the participation of local farmers and ranchers whose businesses will grow more nutritious, locally sourced whole foods and sell them to more people. Private companies like these, with health-aligned business interests, are much more likely to realize the promise of private-public partnerships than those that have damages to hide. An important corollary of this movement toward greater local control would be tighter strictures barring ideological and business advocacy outfits from disguising themselves as philanthropists. And for such measures to take hold in any meaningful way, the media and the public will resist the efforts of foundations to interfere with the legitimate operations of government, while also resisting the efforts of foundations aimed at gaining advantages for a narrow class — particularly within the media itself. In other words, what‘s needed most of all is a recognition that philanthropy must do more than provide charity, as Oscar Wilde suggested in 1891. Foundations still need to supply the desperately needed overcoat, as Wilde did himself, and do whatever they can to address the immediate needs of people in distress. But the real task is to come to grips with the reasons why so many people are left out in the cold in the first place. Maria Bustillos is the author of Dorkismo and Act Like a Gentleman, Think Like a Woman. She received invaluable assistance on this piece from Chris Lehmann. 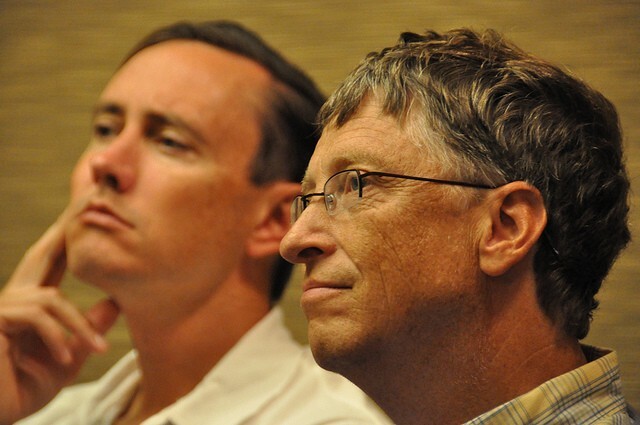 Photo by jurvetson.